The House and Senate are in the last weeks of the 115th Congress. Several new bills of importance to the disability community have been introduced in the last days of this session. It is not expected that these bills will pass and become law this year but their introduction is an important look at priorities for the 116th Congress and a chance to build momentum around critical issues. Expand the availability of federal demonstration grants within the Elder Justice Act that could be used to promote guardian background checks, train court visitors, and develop state guardianship databases. Senator Casey also introduced the Readiness for Elders and Americans with Disabilities Inclusion (READI) for Disasters Act on November 29. The READI for Disasters Act would establish a National Commission on Disability Rights and Disasters to study the needs of individuals with disabilities, older adults and others with access and functional needs throughout emergency preparation and planning, disaster response, recovery and mitigation. Additionally, it would provide financial support to develop and provide technical assistance and training to state and local emergency managers as well as disaster relief agencies. Senators Tammy Duckworth (D-IL) and Amy Klobuchar (D-MN) have co-sponsored the bill. Increase transparency and oversight to prevent future abuse of students. The Health Equity and Accountability Act was introduced by Senator Mazie Hirono (D-HI) and is co-sponsored by Senators Tammy Duckworth (D-IL), Ben Cardin (D-MD), Kamala Harris (D-CA), Cory Booker (D-NJ), Jeff Merkley (D-OR), Tim Kaine (D-VA), Richard Blumenthal (D-CT), Kirsten Gillibrand (D-NY) and Sherrod Brown (D-OH). This legislation is a counterpart to H.R. 5942, which was introduced into the House in May. Both bills seek to narrow healthcare disparities and improve the well-being of minority individuals. 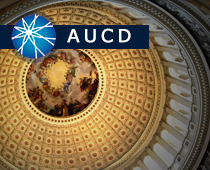 AUCD and our members have been following the negotiations around the differences between the House and Senate versions of the 2018 reauthorization. Negotiators announced on Thursday that an agreement in principle has been reached. Reports indicate that the proposed work requirements for the SNAP programs are not in the final version. It is anticipated that the final bill will be voted on by the Senate this week and the House before the end of the year. Congress faces a December 7 deadline to resolve the remaining 25 percent of the federal budget. Failure to do so could create a partial government shutdown. The President has publicly stated that any budget he will sign must include at least 5 billion dollars for border security. State health officials are increasingly alarmed that thousands of legal immigrants are forgoing Medicaid and Obamacare coverage because of a looming rule that many believe will jeopardize their chances of citizenship. The proposed changes to the public charge rule have been published in the Federal Register. The comment period ends December 10, 2018. Our friends at Rooted in Rights have created video resources that illustrate how the change would impact families that include people with disabilities. Making comments is a critical way to impact policy. Liz sits down with Brittany Curry, a.k.a. Inky Brittany, a graphic recorder and facilitator. Brittany answers all of Liz's questions about how graphic facilitation can be beneficial for people with disabilities, is accessible to all regardless of ability, and is something anyone can pursue. Check out Inky Brittany's work at https://www.inkybrittany.com.